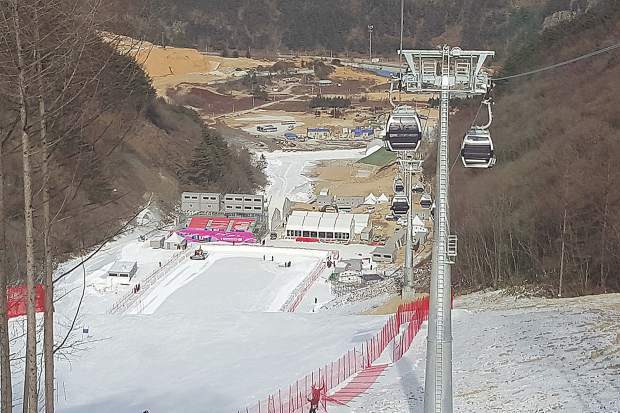 The Jeongseon Alpine Centre in South Korea, where CMC alumnus Geoff Marriner is the mountain operations manager, is a brand new ski area that was created for the 2018 Winter Olympics. Here, the finish area is where the speed events â the downhill and super-G courses â will end and Olympic medal winners will be announced. EAGLE — South Korea is over 6,000 miles away from Colorado, but when it comes to the ski industry, it’s surprisingly close. Nobody knows that better than Allison Kohn Marriner and her husband, Geoff “Salty” Marriner, both alumni of Colorado Mountain College Leadville’s ski area operations program. The couple was hired 15 months ago to join an international team of seasoned professionals producing the 2018 Winter Olympics and the XII Paralympic Winter Games at Jeongseon Alpine Centre in Pyeongchang, South Korea. Geoff, who’s the mountain operations manager at Jeongseon, has been in South Korea full time since November 2015, and Allison has shuttled back and forth between Korea and their Colorado home. The Olympics will be held Feb. 9-25, 2018. After Allison landed in Seoul to meet Geoff last year, they drove together to the new ski area with about a half-dozen Olympic workers who had just arrived in the country. Two of the workers Allison knew from other events at Beaver Creek. Planning and pulling off Olympic Alpine ski racing events takes a spectacular amount of preparation, which is why they have been working on the project for over a year. Neither Geoff nor Allison had ever been off the North American continent before arriving in South Korea, so it took some adjusting. Geoff wrote that he’s learned to be a creative communicator at work. Although there are a few translators available, at times other tactics need to be used. Allison has been surprised at how men and women treat one another at times. The Marriners have found that Jeongseon doesn’t have much in common with Eagle, their home base stateside. Because Jeongseon was built specifically for the 2018 Winter Olympics, it doesn’t yet have much of a community feel. It’s so new in fact that although the racecourse was finished, the area’s infrastructure was still incomplete by the time Geoff and his crew were hosting their first test events last season — the men’s International Ski Federation World Cup downhill and super-G. This March, the area will host the women’s FIS World Cup downhill and super-G as well as the International Paralympic Committee World Cup finals. The route to South Korea was not easy, but the Marriners have made sure and steady progress since they studied ski area operations at Colorado Mountain College. The on-mountain and World Cup ski racing production experience that they’ve gained working at Vail Resorts has helped them to learn the ropes within the international ski racing community. Both have developed solid reputations in the ski business: Allison as a Beaver Creek snowcat operator and lift maintenance assistant, and Geoff as a Vail equipment operator, as well as a Beaver Creek grooming manager and supervisor. While Geoff works full time at the Jeongseon Alpine Centre, Allison travels back and forth between Colorado and South Korea. She works part time as a snowcat operator in South Korea and returns to operate cats at Beaver Creek and do lift maintenance during the summers. And even though the Olympics are a year away, the experience of landing in a foreign country and working toward one of the world’s biggest international sports events has, so far, been invaluable. Carrie Click is assistant public information officer for Colorado Mountain College.